There are currently 114,986 users on this website. 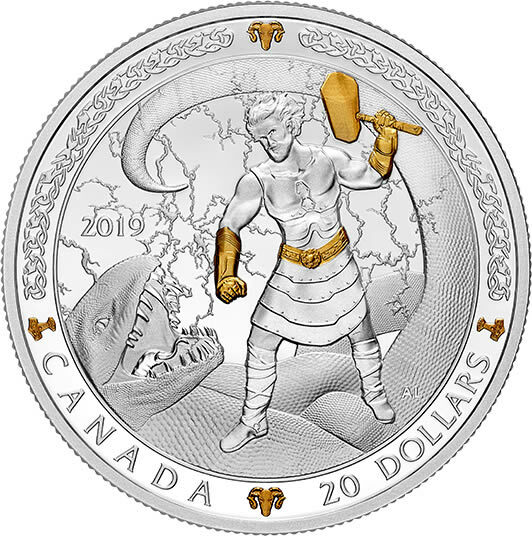 Royal Canadian Mint - Designed by Alexandra Lefort, your coin depicts the battle between Thor and Jörmungandr at Ragnarök, an end-of-days event in Norse mythology. Clad in the finest clothing and armour of the Viking era, the Norse god of thunder stands with his hammer raised, ready to strike the coiled serpent. Selective gold plating highlights Thor's hammer (Mjöllnir), iron gloves (Járngreipr) and belt (Megingjörð). A Norse art-inspired pattern lines the rim on the obverse and reverse. The gold-plated goat heads represent Tanngrisnir and Tanngnjóstr, who pull Thor's chariot, while the gold-plated Mjöllnir is based on a 10th-century silver pendant. The obverse features the gold-plated effigy of Her Majesty Queen Elizabeth II by Susanna Blunt.